2. Progress, June 18, 1778. 3. Progress, June 19, 1778. Forward to Battle, June 28, 1778. The Advance Force: Scott’s, Wayne’s, Lafayette’s, and Lee’s Detachments. Daily Movements of Detachments Later Incorporated into Lee’s Advanced Corps. 13. Echoes of 1778, Three Years After. 3. The Road to Hopewell. 4. The Bungtown Road Controversy. 1. Army General and Brigade Orders, June 1778.
a. Orders Regulating the Army on the March from Valley Forge. b. Orders Issued During the Movement from Valley Forge to Englishtown. 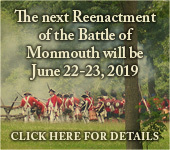 "Eyewitness to Battle: Alexander Dow's Account of Monmouth," The Brigade Dispatch, vol. XXIX, no. 1 (Spring 1999), 15-16. ALHFAM Bulletin, vol. XXXIII, no. 3 (Fall 2003), 23-34; no. 4 (Winter 2004), 23-34; vol. XXXIV, no. 1 (Spring 2004), 19-28. “‘Knowledge necessary to a soldier …’: The Continental Officer’s Military Reading List, 1775-1778,” Military Collector & Historian, vol. 59, no. 1 (Spring 2007), 65-71. "'None of you know the hardships of A soldiers life …': Service of the Connecticut Regiments of Maj. Gen. Alexander McDougall’s Division, 1777-1778" and Bibliography/Appendix to "None of you know the hardships of A soldiers life …': Service of the Connecticut Regiments of Maj. Gen. Alexander McDougall’s Division, 1777-1778"
A. "Found the regiment lying in bush huts ...": Continental Troops on Campaign and on the March, 1778-1780. B. "Pine huts," "Huts of rails," and "Bush Tents": Virginia and the Carolinas, 1781-1782. C. "Return of Camp Equipage":More on Tents. Military Collector & Historian, vol. 56, no. 2 (2004), 98-106.